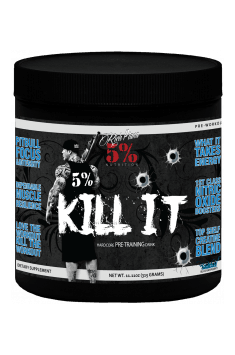 5% NUTRITION Kill It is an advanced pre-workout from the line of Rich Piana’s supplements. It allows to maximally intensify trainings, which provides results in the form of quick achievement of goals. Vitamin B3 – in the preparation was used in the form of niacinamide. It is also called vitamin PP (pellagra-preventive factor). It plays a key role in the metabolism od nutrients, allows to efficiently derive energy. It is also appreciated due to its influence on psychological functions. It improves emotional state, is conducive to well-being, prevents depression. It helps to keep cholesterol under control and optimizes lipid profile. It is essential for the production of a male hormone, testosterone. Magnesium – is an essential macroelement for the human being, is responsible for the proper functioning of the nervous system by regulating neuronal transmission. Its deficiencies give symptoms of irritation, painful contractions and sleep disorders. Proper amount of this element is conducive to promoting cognitive functions. It also influences osmotic concentrations in the organism, regulating cell hydration. Magnesium is also essential for the proper functioning of sodium-potassium pump, thanks to which it influences efficiency of energy metabolism. Sodium – is the main extracellular ion, therefore it is responsible for electrolyte balance on cellular level. It is essential in order to maintain operational potential of cell membranes, including neurons, thanks to which it enables proper nerve transmission. Maintaining physiological ion concentrations at both sides of cell membranes also enables efficient work of sodium-potassium pump, producing a universal energy carrier – ATP. Increasing the supply of sodium is especially vital near training, due to its increased loss with sweat. Potassium – in the supplement appears in the form of citrate and extract from coconut water. Similarly to sodium, it regulates intercellular osmotic concentrations and is responsible for electrolyte balance. Apart from the functions that it fulfills in the organism along with sodium, it also plays an autonomous role in the organism as an activator of numerous enzymes. L-Citrulline – an amino acid exhibiting the ability to stimulate the synthesis of nitric oxide, which is felt, as the so-called “muscle pump”. Nitric oxide is a factor increasing the lumen of blood vessels, thanks to which it positively influences blood supply of peripheral tissues. This conditions its nourishment. During physical effort, the amount of energy substrates reaches skeletal muscles, which enables their more efficient work. Stimulation of tissue nourishment also positively influences post-workout regeneration. Beta-alanine – optimizes acid-base environment in working skeletal muscles, being carnosine precursor. It is a systemic regulator of pH, thanks to which it neutralizes the activity of lactic acid, the increased synthesis of which during physical effort causes pain, limiting physical efficiency. Regulation of acid-base environment is also conducive to post-workout regeneration processes. Creatine – appears in the preparation in the form of highly bioavailable amino acid chelate, in combination with magnesium. It is a supplement both effective and safe, which is confirmed by many scientific studies and sportsmen’s experience. It provides a substrate to a phosphagen pathway of deriving energy, thanks to which, it increases the efficiency of this process. This results in increasing efficiency, especially during efforts, based on phosphocreatine as the source of energy, i.e. short-lasting, such as sprint or strength training. Creatine also demonstrates the ability to modify the activity of myostatins, promoting in this way anabolism. Taurine – stimulates utilization of creatine for energy processes, as it is its transmitter. During physical effort, endogenous synthesis of taurine becomes insufficient, therefore its supplementation may delay fatigue during long training sessions. Moreover, it has stimulating effect on the metabolism of glial cells, positively influencing the work of the nervous system. It increases cognitive abilities, facilitates concentration and memorizing. N-Acetyl L-Tyrosine – highly assimilable form of tyrosine which, by being an original form of many hormones and neurotransmitters, demonstrates multi-mechanism stimulating effect. It is a precursor of adrenaline and noradrenaline, which stimulates the organism to increased physical effort. Tyrosine is also the component of the pathway of dopamine synthesis, which is responsible for muscle coordination and positive emotional states. This amino acid may also influence metabolism, as it takes part in the synthesis of thyroid hormones, thyroxin and triiodothyronine. Creatinol O-Phosphate – a compound which is a structural analogue of creatine, different, however, in its function in the organism. It works as a buffer of acid-base environment, neutralizing the activity of lactic acid, secreted during intensive physical effort. In this way, it delays muscle fatigue and facilitates regeneration. Caffeine anhydrous – a popular stimulant, which owes its function to two most important mechanisms of activity. Firstly, caffeine is a competitive inhibitor of adenosine. It binds with its receptors, preventing access to them and at the same time not activating them. In this way, it blocks transmitting characteristic information, signaled by adenosine, i.e. fatigue. Caffeine also prevents the breakdown of cyclic adenosine monophosphate to its inactive, non-cyclic form. It accelerates in this way cell metabolism and increases effectiveness of adrenaline in the organism. Norvaline – non-protein amino acid, which is an isomer of a popular exogenous branched-chain amino acid, valine. It is an inhibitor of arginase, an enzyme carrying out a reaction of arginine molecule breakdown. In this way, it promotes the functions of this amino acids, increasing the synthesis of nitric oxide. It facilitates the creation of the feeling of muscle pump and nourishment of peripheral tissues. Rhodiola Rosea – also known as roseroot, used mainly due to its adaptogenic potential. It increases tolerance of the organism to environmental conditions, thanks to which it decreases excessive tension and may decrease the level of cortisol. It promotes positive emotional states, stimulates cognitive abilities, facilitates concentration. It may also increase endurance of the organism during long-lasting efforts. Summing up, 5% Nutrition Kill It is a complex pre-workout with optimally selected active substances. It allows to perform trainings on higher levels, thanks to maximal stimulation and physical efficiency. It universally supports fitness and regeneration processes after training. 1 portion (1 scoop) about half an hour before workout. Due to the content of stimulants, the product should not be taken in the afternoon or in the evening in order to avoid sleep problems. In case of people sensitive to the effect of pre-workouts, or people who rarely use them, we suggest decreasing the dose of the product.